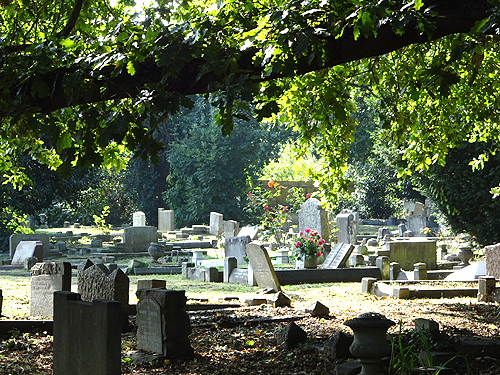 A churchyard is the land surrounding the church and is used as a graveyard. It has been consecrated (set apart as sacred) by a bishop and is sometimes called 'God's Acre'. The area of St James's churchyard, including the church building, is estimated to be about 1.6 acres. The churchyard plan shows details. Footpaths run through the churchyard, but there are no public rights of way. There is a double garage beside the hall which is used mainly for storage for the church and for the nursery school, who are regular weekday hall users. There is also a shed in the churchyard for the storage of garden equipment. The remainder of the churchyard is a burial ground. St James's lych consists of a roofed porch-like structure over a gate, built of wood with four upright wooden posts in a rectangular shape. On top of this are a number of beams holding a pitched roof covered with clay tiles. The lych is really part of the church, lyc being the old English word for corpse or body. 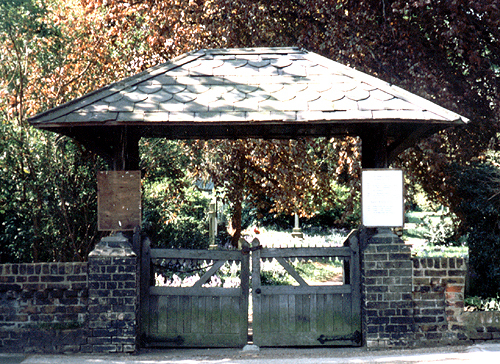 Thus the words 'lych gate' really means 'corpse gate'. Find out about the 2006 Lych gate renovation. 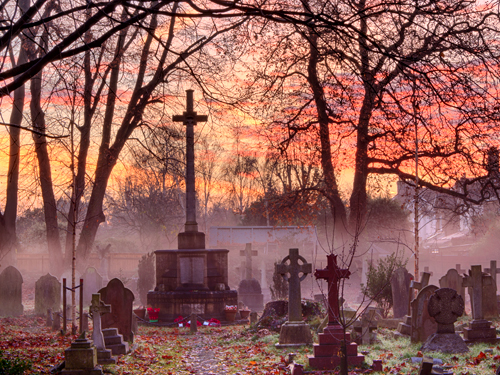 There are over 1,000 graves and over 4,000 people buried in the churchyard. The first burial was that of Walter Richard Daines, aged 11 months in l864 and the very last burial was Bruna (Walter) Blaschke in 1987. 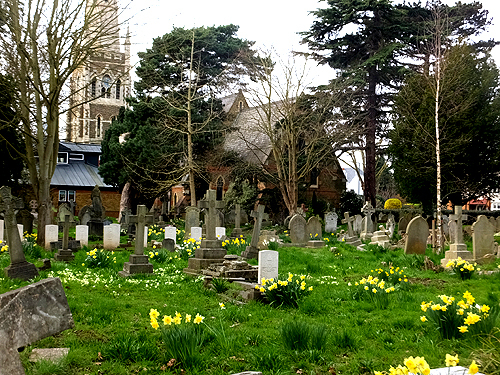 The churchyard was closed by Order in Council in 1991 and is now cared for by the London Borough of Richmond upon Thames. From this point onwards only previously booked spaces could be used for burials and the interment of ashes in the Garden of Rest (sometimes called Garden of Remembrance). Find out about the graves in the churchyard. In the early 1990s a working party was set up to record all the names and position of all the graves in the churchyard and plans were drawn. All this was eventually collated into a booklet 'Churchyard Records 1864-2000' which was published in February 2001. An online searchable database for the churchyard records was developed in 2007 - Churchyard records - search by surname or year. 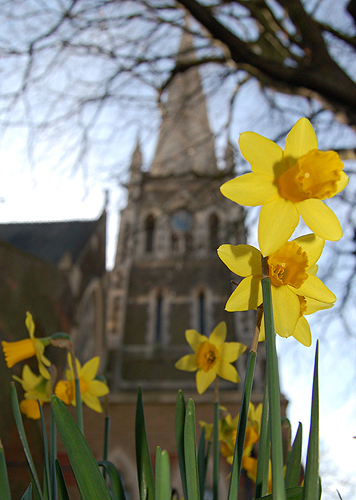 Following the various Diocese of London’s conservation initiatives under the banner of 'Caring for God’s Acre', a charity which promotes and assists in the care of churchyard green spaces, St James Church has taken various steps to become pro-active in the management of the St James Churchyard by working together with the London Borough of Richmond and Wandsworth Council to manage, protect and develop its wildlife flora and fauna. 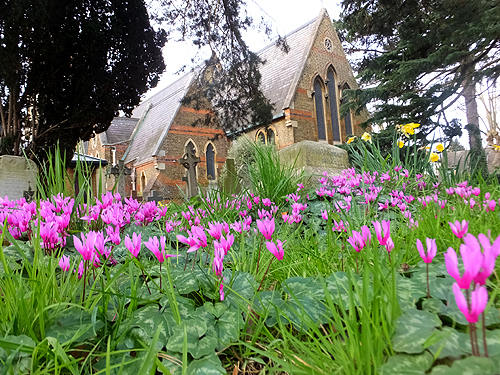 An initial churchyard management scheme has been set up as a trial. This includes creating one, (of two proposed), wildlife meadows, a designated area for ivy to grow, a wildlife walkway parallel to the Park Road boundary, a ‘let to grow’ area along the East boundary and a general encouragement of wild plant growth and cover around the churchyard perimeter to facilitate creature movement. Further developments along these lines will occur over time with a view to the churchyard receiving classification as a ‘designated local wildlife area’. To help with the creation and future maintenance of these wildlife areas the St James’s Gardening Club, (open to all), was launched on Saturday, 18 November. 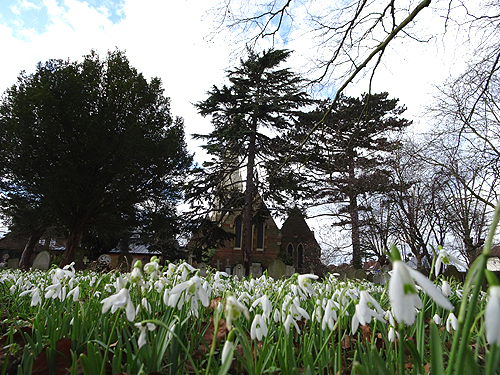 Some of the trees, shrubs and flowers growing in the churchyard have long been thought to have a symbolic meaning. They remind us of things connected with the Christian faith. The yew trees are slow-growing and very long-lived trees, so they have been looked upon as a symbol of immortality and therefore a suitable tree to be planted in the place where people are buried. The prickly leaves of the holly tree have often been thought of as a reminder of the crown of thorns which Jesus wore when he was crucified. The red berries are like drops of blood, and serve to remind us that Christ's blood was shed for us. Thus the holly tree has come to be known as a reminder of the Passion of Christ. Graveyards usually have yew trees and holly in them. Yew trees and holly are 'evergreens' - the leaves do not die in winter. These plants remind us that we can live for ever in heaven. The daffodil and the lily remind us of everlasting life. Though the bulbs look dead when they are placed in the ground, new life springs within them and they blossom into beautiful flowers. So our church is decorated with such blooms especially at Easter time. The lily of the valley, with its white blossoms is a symbol of purity and humility, and it is often associated with Mary the mother of Jesus. The clover, being a three-leaved plant is an obvious symbol of the Holy Trinity. Each leaf has three parts, which are not three separate leaves, but one leaf. So likewise, God is God the Father, God the Son, and God the Holy Ghost; yet He is not three Gods, but one. The Christmas rose has been thought of as a reminder of the Nativity.